Tew Lake | Northern Wilderness Outfitters Ltd. This lake is located within the boundaries of the Wabakimi Provincial Park and is connected by a long waterfall on the west end of Wabakimi Lake. Tew Lake is laid out like a spider with long bays reaching into all directions. We have the only cabin on this lake and it can accommodate parties of up to 8 fishermen. 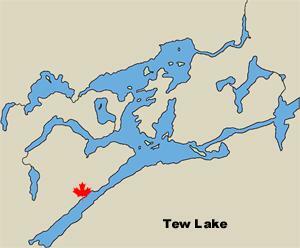 Tew Lake has several sets of rapids and is noted for its fast walleye and northern fishing. This cabin is located on a beautiful sand beach and is equipped with hot shower, running water, solar lights and other amenities. When you combine great fishing, a comfortable cabin, and knowing that you are the only party on the lake, you know a great fly-in fishing trip is awaiting you.